This Slow Cooker Chicken Tortilla Soup is filled with tender chicken, diced tomatoes, corn, black beans, and a combination of spices. With hardly any prep work involved, this flavorful meal will quickly become a household favorite! As I was prepping the ingredients for this Slow Cooker Chicken Tortilla Soup, it was a white, winter wonderland of snow outside my window. Kinda fitting for a slow cooker meal, right? Now, snow and I don’t necessarily mix, as I would much rather be somewhere warm than freezing cold. But, I have to admit that I do love watching snow fall. As long as I can stay warm from inside my house. There’s just something cozy about snow and a good slow cooker dish to warm you right up. And while I use my slow cooker year round, it just feels extra special to use it in the winter. And when I can prep a meal on a lazy weekend and let it work its magic, it sounds even better. It just so happens that tortilla soup is one of my favorites. The hubster and I adore Mexican food, and whenever we go to one of our favorite spots, they always serve us a bowl of their homemade chicken tortilla soup. It’s smooth, creamy, and definitely hits the spot…especially when paired with some chips and salsa! So when I was thinking of a new dish to prepare, this Slow Cooker Chicken Tortilla Soup immediately came to mind. You all know that soup and I share a special love affair (see here, here and here), so it was just a matter of time before this recipe came into play. 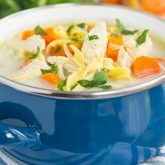 This soup is filled with zesty flavors and simmered to perfection. I used two medium chicken breasts, chicken broth, two cans of diced tomatoes with green chilies, black beans, corn, and some spices for that perfect broth. It results in a warm and comforting dish, filled with just the right amount of flavor. One bite and the hubster and I were hooked. The flavor isn’t overly spicy, and the seasonings blend together perfectly. Pair it was some tender, shredded chicken, and this soup was perfection. If you’re looking for an easy slow cooker dish, then this chicken tortilla soup was made for you! Simply add all of the ingredients to the slow cooker, stir, and walk away. That’s it! About 10 minutes before the soup is done, you’ll remove the chicken breasts, shred, and then return to the slow cooker to warm up. It really can’t get much easier than that! 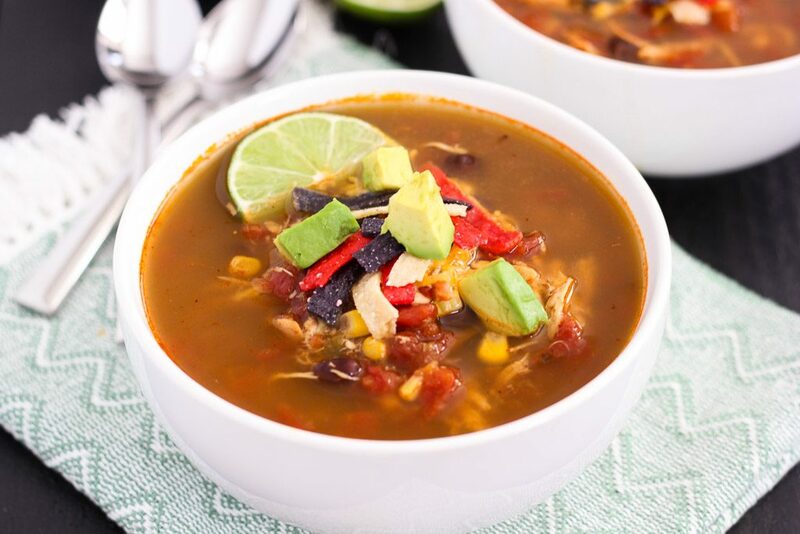 So if you’re craving a slow cooker dish that’s full of flavor and simple to prepare, this Slow Cooker Chicken Tortilla Soup is it! Fast, easy and perfect for lazy weekends or busy weeknights, you’ll love the zesty flavors and tender chicken. Top it with some diced avocado, shredded cheese, and crunchy tortilla strips…perfection in a bowl! Spray a medium slow cooker with non-stick cooking spray or line with a slow cooker liner. Add chicken broth, diced tomatoes, beans, corn, garlic powder, chili powder, paprika, salt, pepper, lime juice, and cilantro to slow cooker. Stir. Add in chicken breasts and cover. About 20 minutes before serving, remove chicken breasts from slow cooker and shred using two forks. Return to slow cooker and heat until warmed. Serve immediately with some shredded cheese, diced avocado, or tortilla strips, if desired. Soup is mild in flavor and not overly spicy. If you like a spicier broth, add more chili powder or try hot/spicy diced tomatoes with green chilies. Thanks, Puja! You could definitely make this as vegan or vegetarian version. Definitely, Kate! Thanks for the kind words! I have never made this in a slow cooker before, but any way that I can use my slow cooker is good with me! Tortilla soup has magical properties I think. It just has a way of perking me up! Thanks, Sarah! 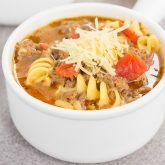 This soup is SO easy...just throw everything in and leave the slow cooker to do the work! I totally agree about the snow - as much as I'm not a winter fan, I love watching the snow fall and having a comforting bowl of soup! 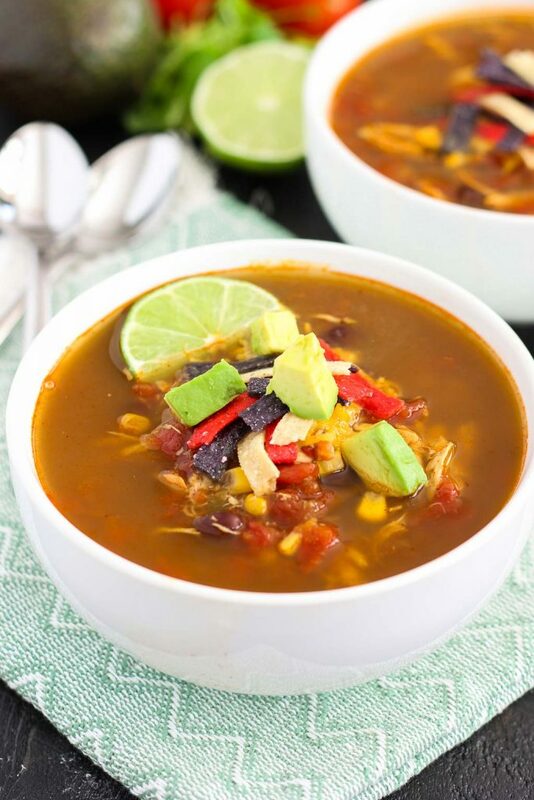 Chicken tortilla soup is one of my favorites and your version looks delicious. I love anything I can toss in the slow cooker! Pinned! Thanks for the kind words and pin, Keri! 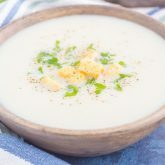 One of my favorite soups as well! I love your simple ingredient list. It's healthy, but also full of flavor (and the whole family would eat it)! Yes! I love the simply and healthier ingredients, too, Blair! Thanks! I love watching snow fall, to me it's hypnotizing... and even if it's dreary out, the reflection of the snow on the ground makes it appear to be beautiful outside. Snow makes me happy... but not FEET of snow... I'm good with a couple inches. ;) Anyways, LOVE this soup! Anything tex-mex makes me giddy and my belly is totally craving a bowl of this easy deliciousness pronto... with a bucket of chips and salsa! So good! Pinned! Cheers, friend! I agree, Cheyanne! Watching the snow fall can be so relaxing, as long as I don't have to drive in it! :) Thanks for the soup love and pin, friend! Thank you, Catherine! I do love cooking in the winter too! This sounds fantastic and so easy! You had me with the avocado on top, I'm not going to lie, I'll pretty much do anything for some avocado ;-) There really is nothing better than smelling something like this cooking in the slow-cooker all day, love it! I love Tortilla Soup, and if it's done in the slow cooker, then all the better! Slow cooker soups are the best! Thanks, Adri! Even though our winters can get pretty bad, I am still not fond of the cold weather either. Some hot soup is just the cure for that. This looks so comforting and delicious, Gayle! We are on a big soup kick lately since we got sick a few weeks ago and tortilla and enchilada soup are among our favorites! Love that you made this in the slow cooker too! Thanks for the kind words, Kelly! I agree, soup is the best cure for the cold weather! Chicken tortilla soup is definitely one of my favorites and I love that you made this in the slow cooker, Gayle! Definitely perfect wintertime food :) I wish I had a big bowl of this! Tortilla soup is an absolute favorite at our house! This looks delicious! I love watching the snow fall too .... as long as I don't have to go anywhere! haha Hope you had a great weekend Gayle! Thanks for the kind words, Ashley! Hope you had a great weekend, too! Yes, I'm sure lots of soup weather is still in store! :) Thanks, Ashley! Thanks, Mira! I love how easy this is to make, too! I adore slow cooker recipes! They make life so much easier, don't they? It's supposed to snow again sometime this week, so this chicken tortilla soup would make for a cozy meal. Thank you, Jen! Slow cookers definitely make life so much easier! Haha I agree...snow definitely needs to be gone by mid March! Thanks for the kind words, Annie! You had me at slow cooker!! Girl I love Mexican inspired soups! I know Dave would be all over this chicken version! Thanks for the kind words, Sam! Thanks for the soup love, Marcie! Soup is one my faves too! It's already spring here, but I'll eat soup all year long. :) This one looks so tasty! 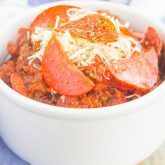 I love anything in the crock pot-- so easy! I wish it was spring here! Send your warm weather my way, please! :) Thanks, Jess! Falling snow is so mesmerizing! 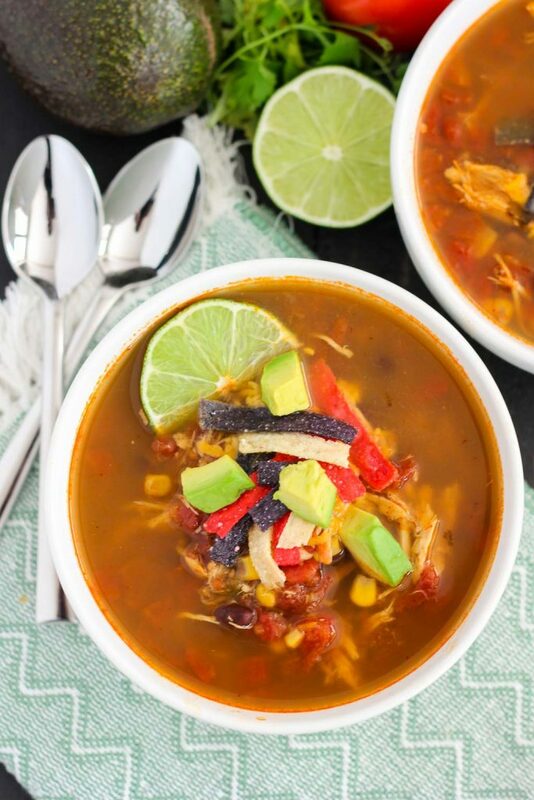 This chicken tortilla soup looks like the perfect comfort food to watch the snow fall! Yes! I love soups so so much! This looks perfect! And it is even better if it is a slow cooker recipe! Chicken tortilla soup is a guaranteed hit at our house! Love that yours is made in the slow cooker! I LOVEE chicken tortilla soup, why I haven't made it at home yet? I need this soup in my life! 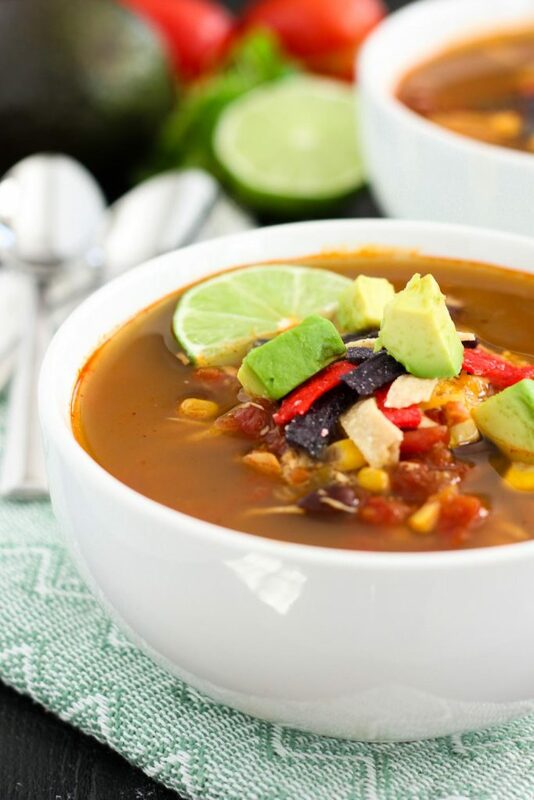 Love slow cooker recipes and tortilla soup is always a great hearty and easy dinner choice. Love the way you did your recipe!